September is upon us folks!!! I have to say Fall is my favorite time of year. Apples, pumpkins, Halloween and Thanksgiving all of my favorite things. I know I am jumping ahead of myself because Fall is still kind of far off for us Texans. Yep were still in summer mode. Actually this week we are enjoying a bit of cold front that blew in, so our temps will be in the 80's this week. With temps like that you can't help but to get into the Fall spirit. I am looking forward to turning on the oven more and baking some yummy Fall treats. Today I want to share my September Menu with y'all. I know its a little late, but time hasn't really been on my side the last week. I have quite a few (New) meals jotted down, so that should be fun. Red titles are recipes linked back to MK or another site. New recipes will be shared as I make them. I hope everyone has an awesome day. trying this for the first time this month. I have a baby due in the next week so it's a good month for it:) Thanks for all the great ideas! I made the chicken tenders tonight and they were great. My daughter is a vegetarian. So I used some of the maranade to maranade some firm tofo. Then cooked it the same in a different pan. She thought it was good. We eat whole grain pasta and brown rice so it's not that bad. Beth congrats on the new baby. I'm so impressed that you plan an entire month. It's hard enough for me to plan a WEEK! Thank you Libby ;) You are doing great at planning a two week menu so don't worry on that one. I do a month because DH gets paid once a month. It makes more sense for us to do our dinner plan monthly. If you are getting paid bi weekly than a 2 week plan would work best for you. I hope I could get my brain together enough to do a month's worth of meals! I'm lucky to go day by day sometimes! You are inspirational with menu planning - I'm going to keep trying - really! I am making my recipe list (& ingredient list) tonight. Going through my family cookbook and pulling out our favorites for the 1st month. By the way, how often do you make a dessert? I noticed you had 4 (?) desserts listed. I walked into work tonight and found a co-worker looking at your blog. "Oooh, Leave that up!" I had to take a look and I am loving what I see! 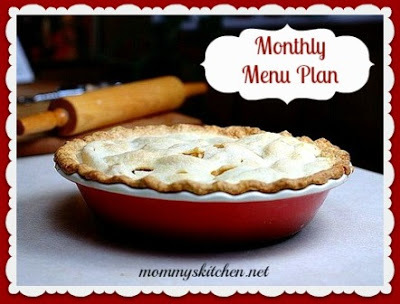 My menu's have been in a rut lately but now I have lots of ideas to try. Thank you for sharing everything! We have printed several of your recipes already! I will be spotlighting you on my blog later this week! My sister in law will LOVE LOVE LOVE you!